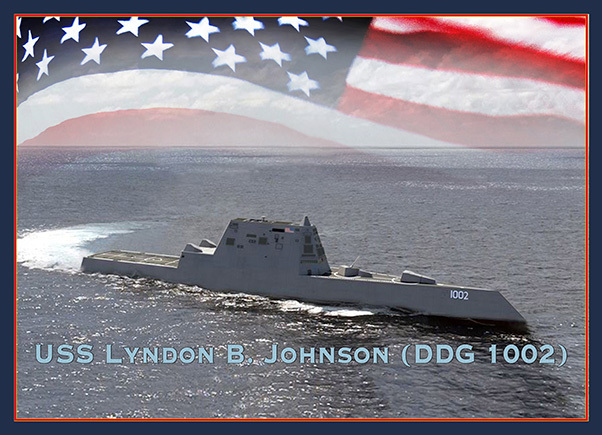 The keel was authenticated by former President Lyndon B. Johnson’s daughters and ship co-sponsors, Lynda Johnson Robb and Luci Baines Johnson, by welding their initials into the keel plate. While the keel laying has traditionally represented the formal start of a ship’s construction, advanced modular shipbuilding allows fabrication of the ship to begin months in advance. Today, the keel laying continues to symbolically recognize the joining of the ship’s components and the ceremonial beginning of the ship. As one of the Defense Department’s largest acquisition organizations, PEO Ships is responsible for executing the development and procurement of all destroyers, amphibious ships, special mission and support ships, boats, and craft.